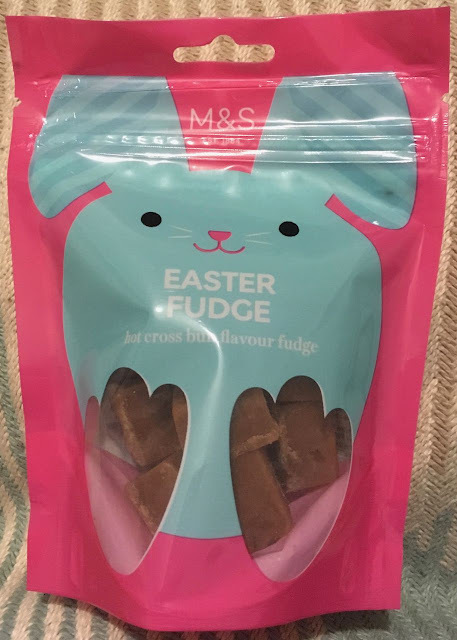 I found this wonderful sounding bag of seasonal fudge in Marks and Spencer. Easter fudge isn’t the most specific description of a product, the flavours of Easter range from chocolate eggs through to Simnel cake, but this particular new product is fudge with a Hot Cross Bun flavour. I’ve mentioned on the blog before that my favourite spice is cinnamon, and as Hot Cross Buns contain a decent amount of cinnamon I knew this was going to be a hit with me. | opened up the bag and let the mix of spices fill my senses, and its sweet and heady tones filled my nostrils with delight. If it tasted half as good as it smelt I would have been quite pleased. 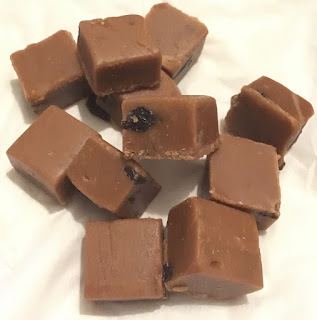 There were quite a few pieces of fudge in the bag and they were cut into fairly large cubes, each of which took me more than one bite. The texture was firm, but still in the realms of soft. They were dotted with raisins, but there weren’t as many of the currants as I would have liked, I think this is my only negative comment on the fudge. The flavour was an absolute delight. First and foremost the taste was predominantly buttery and sugary, but as I’m remarkably sweet-toothed this was not a problem. What came next was a fabulous hit of warming spices, and yes there was plenty of cinnamon so I was in heaven. The next flavour are the lemon peel giving a pleasing amount of sourness on the odd bite and then there was the secondary warmth from nutmeg. If you have any love for cinnamon, and a highly tolerant sweet-tooth then I can’t recommended this enough. I’m going back for a second bag.